Moose hunters in some areas can be happy; success rates and tag availability are quite high. Maine, for example, will sell 4,085 moose permits for the 2014 season, down only by 25 from last year, but well above the long-term average. The overall success rate was 72 percent, and the statewide population is estimated at up to 70,000, the highest number in the Lower 48. Drawing a tag, however, is the hard part. More than 55,000 people applied for a moose permit last season. It's a lot easier to get a tag in Alaska. With a population of 200,000 moose, it's no wonder Alaska remains North America's premier destination. Populations are increasing in some areas of the state and falling in others, thanks in part to severe winters and predation, mostly by wolves. Now the not-so-good news: Moose populations are falling in some states and Canadian provinces. Numbers appear to be growing in Saskatchewan and somewhat steady in Yukon, which has an estimated 70,000. British Columbia and Ontario, however, are reporting declines. Tag allocations are down as a result in BC, which has seen a decline of up to 70 percent in some regions. The Dryden and Thunder Bay areas will see an 88 percent decrease in tag allocations. Minnesota halted all moose hunting indefinitely in 2013 due to plummeting numbers. The animals are subject to an in-depth study to determine why the state's moose population has fallen 52 percent just since 2010. New Hampshire also has seen a 40 percent decline in some regions over the past three years. Vermont's moose population has also fallen. Moose in the Rocky Mountain states are stabilizing in some regions after falling dramatically in the 2000s, but they continue to decline in others. Wyoming Game & Fish spokesman Al Langston says his state's moose decline is linked to a number of factors, including predation by bears and several dry years. "Drought really impacts moose habitat," says Langston, "and we've had some dry years." Tag allocations may be down in Wyoming, but those who draw are likely to kill a bull, adds Langston. He says the Bighorn, Medicine Bow, and Bridger-Teton national forests all offer good hunting. 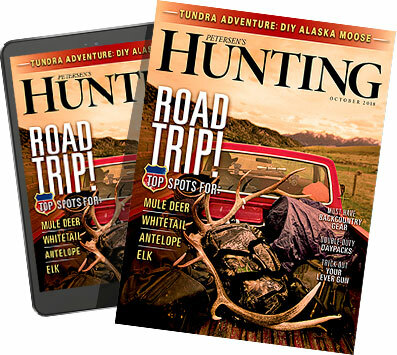 Success rates are also high in other Western states, including Montana and Idaho, which offer once-in-a-lifetime tags and a stable moose population, says Idaho Fish and Game spokesman Toby Boudreau. Good bulls are taken from the Panhandle region south to the Utah border, but the heaviest concentrations tend to be in the northern part of the state. Utah also has a moose hunt, and populations have stabilized after falling in recent years, thanks in part to a string of severe winters and an outbreak of winter ticks. Only Colorado has seen a population increase recently, although the state is at the southern range of moose and only about 2,300 animals inhabit Colorado. Still, Colorado Parks and Wildlife plans on selling a few more licenses this year, notably in units 1, 201, 15, and 27. With few exceptions, that's about the only good news coming from moose country.